Look mom, I can hold it! Bree, Crispin and Ranger did very well at Mountain Valley's WC test on Thursday night. The club does the test every 2nd Thursday throughout the summer at Christie Conservation Area. 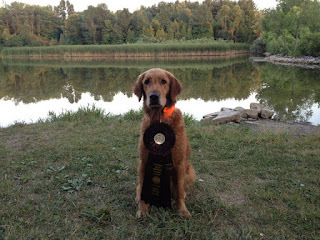 Ranger and Bree passed their WCI (Working Certificate Intermediate) - which consists of a double retrieve on land, with an honour and a double retrieve on water. Crispin passed her WC - which consists of 2 singles on land and 2 single on water. Wendy Hunter and Leia (Tidewaters Lady of Leisure) did a great job running and passing their WCX. Although Wendy said she was very nervous, she looked like an old hand...and you couldn't ask for a better performance from Leia. Woohoo! Huge congratulations to all the Tidewater dogs! Sonny and I are going to give the WC a go at the National in BC. Fingers crossed he doesn't get stage fright. Atta girl Leia! We can't wait for puppies!! !